Health Law Myths: Outside The Realm Of Reality Are you really going to have to have a computer chip implanted in your head as part of the new health law? Will the law allow President Obama to create his own private army? While there are outrageous rumors circulating about the health law, some claims are grounded in truth. Find out what's true and what's not in political messaging during the 2012 election season. Misconceptions have been circulating about the health overhaul bill that was signed into law earlier this year. 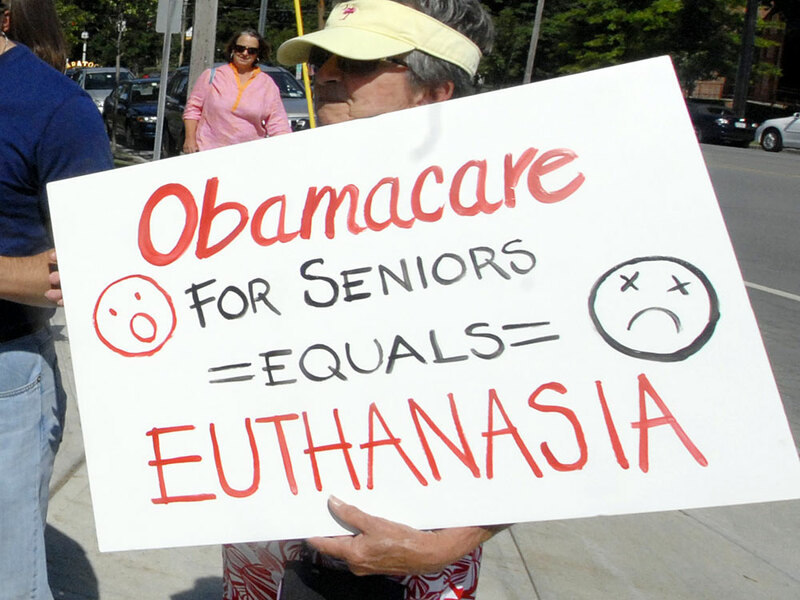 A sign from a 2009 rally references the "death panel" myth. With a law as long and as complex as the Patient Protection and Affordable Care Act, it's natural people are still a little confused about what it does and doesn't do. But some things being said or circulated on the Internet about the health law are well outside the realm of reality. It turns out, though, that many of these more outlandish claims have at least some basis in truth. Here are some of the more popular myths about the law and the fact that gave rise to them. 1. The law requires people who want public health insurance to be implanted with a microchip. The origin of this, says Timothy Jost, a professor at Virginia's Washington and Lee University School of Law, is a provision of the House-passed health bill that was ultimately dropped. It called for the Food and Drug Administration to create a registry of medical devices that could be implanted in people. "We're talking about things like pacemakers, hip implants -- things like that," he says. So "that when they fail, we know what's going on, we know the incidence of it and we know how serious the failures are." But somewhere along the way, people also saw on the Web stories about the FDA's approval of the first implantable microchip in humans that could store medical information and somehow conflated the two things. "People combing the Web found these microchips and saw this implantable medical device registry as an attempt to implant microchips in people," Jost says. "And then the rumor expanded to say that all people who signed up for the public plan that was in that bill would have to have a microchip implanted." That was never true. And, in fact, the device registry never even made it into the final bill. 2. The law creates a new "private army" for President Obama. This actually dates back to a speech then-candidate Obama made in 2008, on his way to the Democratic National Convention, when he called for "a civilian national security force that's just as powerful, just as strong, just as well-funded" as the nation's military. The president was actually referring to such organizations as the Peace Corps and AmeriCorps, as well as other nonmilitary government officials who interact with the public in and outside the U.S. But some took a far more sinister view of what he meant. So when the new health law created a "ready reserve" within the Public Health Service Commissioned Corps, "the people who were looking for the private army knew they had found it," Jost says. But this new entity will be anything but private. "Now, the Public Health Service -- and I don't think a lot of people realize it -- is one of our uniformed branches of service," Jost says. The 6,000-plus-member commissioned corps is overseen by the U.S. surgeon general, who holds a rank equivalent to a four-star admiral. And the effort to create a more deployable force within the PHS Commissioned Corps dates back to at least 2003, when then-Health and Human Services Secretary Tommy Thompson, in the wake of Sept. 11, wanted to ensure that the government had a sufficient supply of doctors, nurses and scientists to respond to a terrorist or bioterrorism attack. What the law actually does authorize is creation of a reserve corps that can be called up in time of national emergency, "for things like Hurricane Katrina or a nationwide epidemic," Jost says. 3. The law requires the hiring of 16,500 new, armed Internal Revenue Service Agents. Yes, the IRS will be involved in implementing the new health law. That's in part because people will have to report on their tax forms whether or not they have insurance to comply with the new health insurance requirements that begin in 2014, and in part because there will be many new tax credits and deductions available to help people afford that insurance. And yes, the IRS will need more staff to carry out many of the new responsibilities that come with the new law. The agency might need $5 billion to $10 billion in additional funding over the next decade, according to the Congressional Budget Office. But both PolitiFact.com and FactCheck.org say that Republican claims that such totals would amount to anywhere near 16,500 agents are exaggerated. Meanwhile, the law specifically exempts people who fail to obtain health insurance from criminal penalties. "They can't levy against your property," says Jost. "They can't impose liens." And the guns? "The IRS does have armed agents to deal with things like the Mafia and Colombian drug lords and all the other things the IRS does deal with," Jost says. But not lack of health insurance. 4. The law requires you to begin to paying taxes on your health insurance next year. This is a classic misunderstanding. Starting next year, employers that provide health insurance will have to begin putting on workers' annual W-2 forms the amount they contribute to workers' health insurance premiums. But the law doesn't change the tax treatment of those premiums -- they're still exempt from income tax. "This provision is informative," Jost says. "It's to give people, to give consumers information that employers are spending an awful lot of money on their health care and hopefully people will look at that and realize, 'Maybe if I use my health care a little more carefully, my employer could pay me more in my paycheck and pay less for health insurance premiums.' "
Starting in the year 2018, some people with very generous benefits could indirectly start paying a so-called Cadillac tax if their health insurance exceeds certain thresholds, but there are several exceptions built into that tax, including those for employers who have workforces that are older or sicker than average. 5. The law dictates what you can and can't eat. The health law has an entire section on public health and wellness, and included in that section is a provision requiring chain restaurants with 20 or more locations to make available nutritional information, including calorie counts, or most of its regular menu items. "Now HHS -- the Department of Health and Human Services -- has the responsibility for helping entities figure out how many calories are in each of their menu items. And, as part of the rules, they can look at standardization of the menu as one of the issues," Jost says. What that means is there is going to be some variance in the number of calories from hamburger to hamburger. "That's one of the considerations that HHS is supposed to take into account," he says. "But I do not read the statute as HHS is going to determine what McDonald's or Wendy's is going to have on their menu from here on out going forward. And it certainly has no authority to tell anyone else what is on their menu." 6. The law requires hospitals to fire obese employees. This was a painful lesson for one hospital administrator, who failed to follow the rule of "confirm rumors before acting on them." The interim president and CEO of the Ohio Valley Medical Center and East Ohio Regional Hospital sent a letter to the homes of some 1,800 employees informing them that "we have recently intercepted a rumor/advance intelligence that the Commissioners of the Healthcare Reform Bill are seriously considering the following proposal: 'Hospitals will be denied Medicare and Medicaid reimbursement, in whole or in part, if more than five percent of hospital employees are 25 percent heavier than the generally accepted height and weight guidelines.'" One tipoff should have been that there are no "Commissioners of the Healthcare Reform Bill." The law is being implemented largely by the secretary of health and human services and the people who work for her, including the administrator of the Centers for Medicare and Medicaid Services, or CMS. The law does create an Independent Payment Advisory Board to make recommendations about how Medicare can save money, but it says nothing about withholding payment based on any characteristics of hospital personnel. CMS Spokesman Peter Ashkenaz told a local television station that "Medicare and Medicaid reimbursements are based on hospitals and treating patients" and that the agency does not oversee health care employees. The hospital administrator retracted what he called "misinformation" three days after the letters were sent.